The town of Moab has numerous options for lodging. You should have your choice of anything from your standard chain hotel, to various inn’s, cabins and condo rentals. This is a 55k people! The aid stations at Red Hot are more than adequately spaced at roughly 6 to 7 miles apart. You can expect normal, high quality ultra race aid station fare. Though the race does not allow drop bags, the stocking of the aid stations should satisfy even picky runners. Red Hot has grown exponentially over the years to become one of the largest trail races in Utah. This isn’t a low key affair and solitary affaire. The race attracts a variety of different runners. The distance and popularity of the race lends itself to more of a first time trail/ultra running crowd with a dash of super-fast elite runners up front. 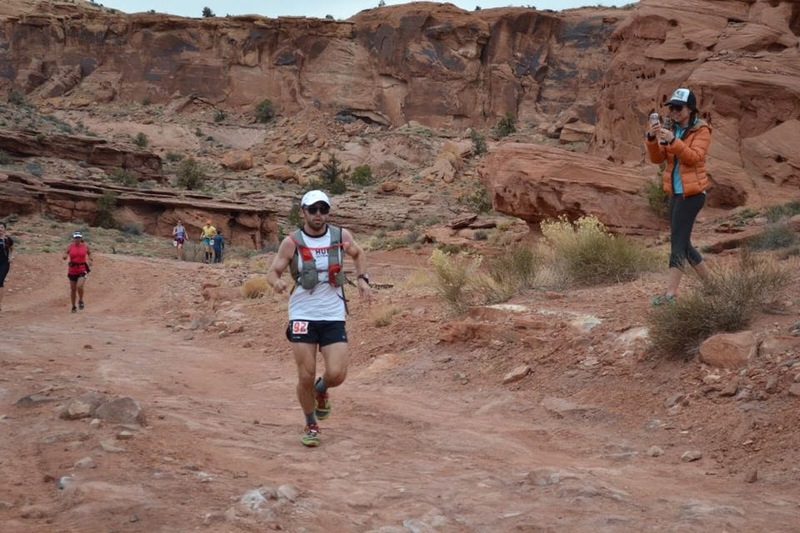 A beautiful course that features views of Dead Horse Point State Park and Canyonlands National Park. Crowded start lines and a massive conga line for the first few miles of the race. Extremely runnable jeep roads with technical slick rock sections in between. Roughly 300 finishers for the 55k and north of 300 finishers for the 33k. A deceptively difficult course despite a lack of huge vertical gains and losses. Slick rock makes for technical running, especially this early in the season. Moab, Utah sites at just over 4000 feet above sea level. While this isn’t considered much elevation for those living in the area, those coming from out of state may feel it. I’ve had the pleasure of running the Red Hot 55k in 2013 and 2014. My overall experience with the race has been a positive one. Those years, I’ve used the 55k as a way to measure my winter training and fitness level and get prepared for a longer spring race like the Buffalo Run 50 or 100 miler. Red Hot is a great venue to bring a group of friends, enjoy the warmer weather of southern Utah and get early season race miles on dirt. The overall race field is large; as previously mentioned. Don’t expect a lot of solitary running, especially towards the middle of the pack. I’ve also found that my legs aren’t really prepared for the technical running on slick rock so early in the year, so keep that in mind. A few thousand feet of gain doesn’t seem like much, but some sections just plain aren’t fast running. For more information please see my 2014 race report below.